I’m on a roll! Yup, I’m actually taking the time to do some Christmas baking this year! I have always wanted to make biscotti as it seems slightly exotic to me, and this recipe really stood out! I’ve been cooking with saffron a lot this year, but had never imagined it in biscotti. Well, let me assure you, this recipe is stunning. Imagine the sunny fragrance of saffron; the rich bite of dark chocolate; the sweet tangy acidity of orange rind, and the bright green, salty crunch of pistachios. I dunked my biscotti in white chocolate, but these cookies don’t really need it. 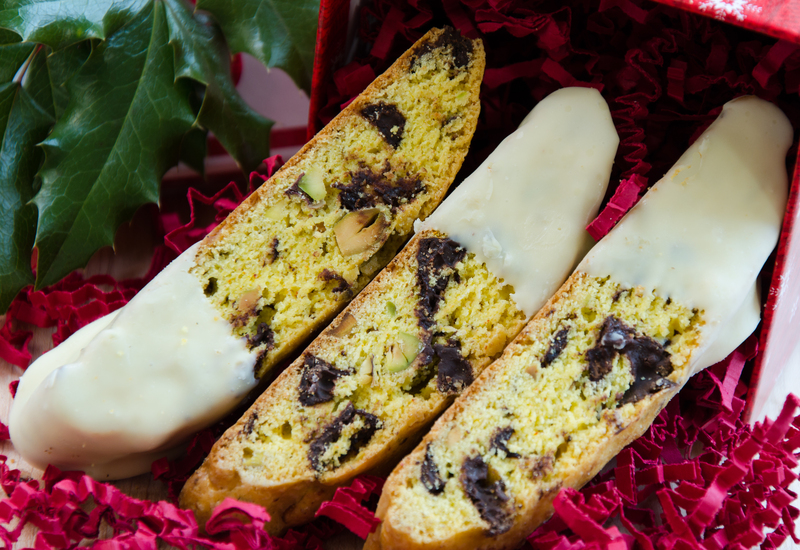 The choice is yours, but no matter what, these biscotti will be the star of your Christmas baking this year. I discovered this recipe in the Winter 2014 issue of Taste magazine and will be sharing it with my blogging buddies over at Fiesta Friday this week. Come and join us! Our host, Angie, from The Novice Gardener hosts this virtual blog party every week, and we are so happy she does. We get to mingle a bit and share our latest and greatest. Merry Christmas everyone, and I hope you enjoy the biscotti. These are gorgeous, even if you don’t dip them in chocolate! Mix together flour, salt and baking powder in a small bowl and set aside. In a large bowl, cream together the butter, sugar, orange zest and saffron, until pale and fluffy. Beat in the eggs, one at a time. Add the flour mixture and stir until combined. Stir in the pistachios and chocolate chunks by hand with a wooden spoon. Gather together the dough and divide in half on a prepared baking sheet. Shape each portion into a log, 2 inches wide by ¾ inch high. Be sure to space the logs 3 inches apart to allow for expansion while baking. You may want to use a wet spatula to make this easier. Bake until almost golden: 30 – 35 minutes. Remove from the oven and let cool on the tray for 10 minutes. Cut diagonally into ½ inch slices and stand them up on a cooling rack. Place the cooling rack on a new baking sheet and return to the oven. 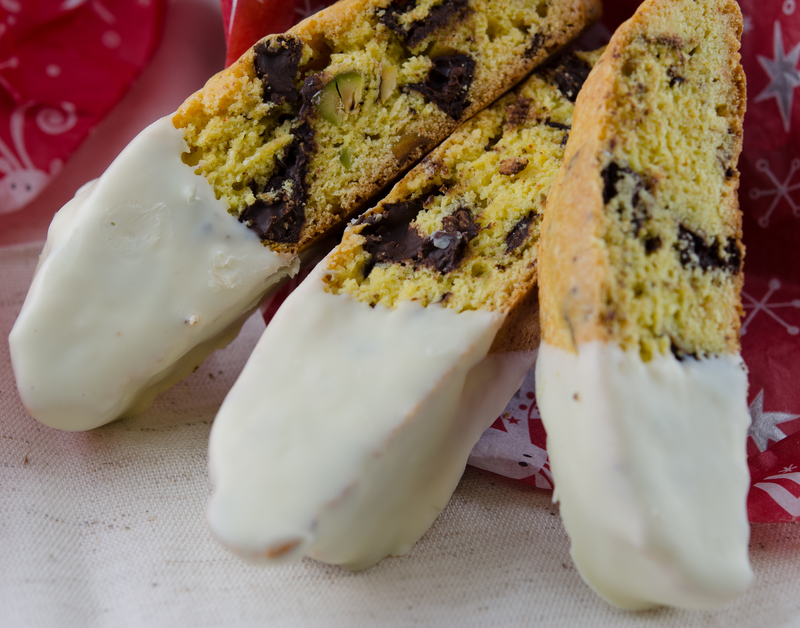 Bake for an additional 20 – 30 minutes until the biscotti are very firm and golden brown. The centers may be a bit soft, but they will continue to dry out as they cool. Dip in melted chocolate and place on parchment paper to cool. Store in an air-tight container for up to one week at room temperature, or freeze for up to one month. I love to serve these with a rich cup of coffee. I have never thought to use saffron! It imparts such a beautiful color and subtle flavor. Just in case you dont know about this, i used to use safflower threads when I wanted a similar color, but didn’t need the flavor. You can buy a thousand pounds of safflower threads for the same price as one ounce of saffron! Beautiful biscotti! A new discovery! Saffron biscottis! Brilliant and gorgeous. Merry Christmas Juliana! I am such a biscotti fan! Loved the addition of saffron in it with orange zest. Biscotti are my favorite treats, Julianna, I like them crunchy and so good with a strong coffee 🙂 Happy FF and Merry Christmas! Oh wow! these look SO GOOD!! I love that you added Saffron! It’s added a beautiful colour to it! I love biscotti and having this on the side of coffee would be perfect!! Once again: you are amazing!!!! Thanks so much! I know what you mean about the price of saffron, but I have found a little market that sells it at a reasonable price! It really is lovely though, every time that I use it! Hey Nancy! So glad you love this! I have been learning about how versatile saffron is! Oh these look downright amazing Juliana. I think the addition of saffron definitely took it to another level. I’ve never tried to make biscotti before, but I’ve seen a few wonderful recipes lately, and promise myself that I’ll give it a go soon. Hey Chitra! Thanks so much! I hope you give this recipe a try and that you really enjoy it! Happy Fiesta Friday to you! Oooh biscotti, my faav. And that too saffron flavor, amazing. Nice job on your first biscotti – they look pretty professional to me. Merry Christmas to you too! 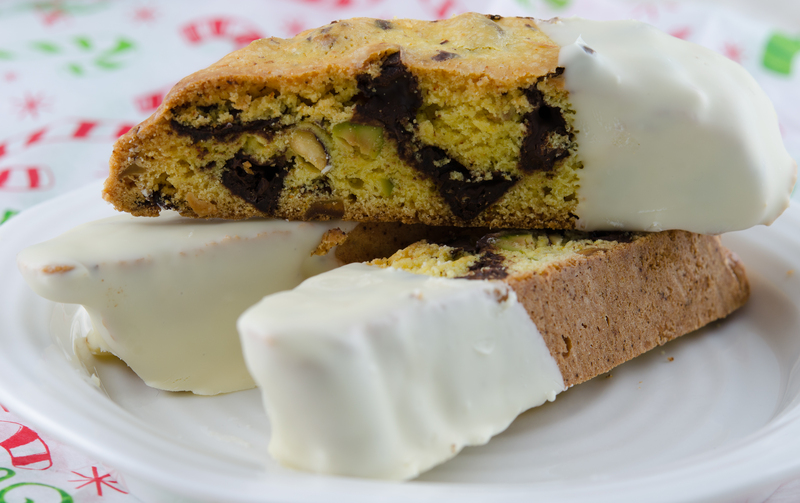 Biscotti are one of my fav cookies! And you can’t go wrong with such a great combo of pistachio and saffron! Saffron used for biscotti sounds as a great idea! You shaped them perfectly!